FERGUSON, MO--The body of Darren Seals was found in a burning car two weeks ago with a bullet to the head. His funeral service was held on Saturday September 17th, 2016. Coincidentally, the service took place on the same day and just upstairs, in the same building as the InPDUM 25th Anniversary Convention. InPDUM’s President, Kalambayi Andenet, also from St Louis and friend of Seals was invited to speak at the service. After finishing her Convention address, she quickly ran upstairs to the packed Sanctuary of the Greater St. Marks Church where she delivered a powerful speech calling the people to struggle. 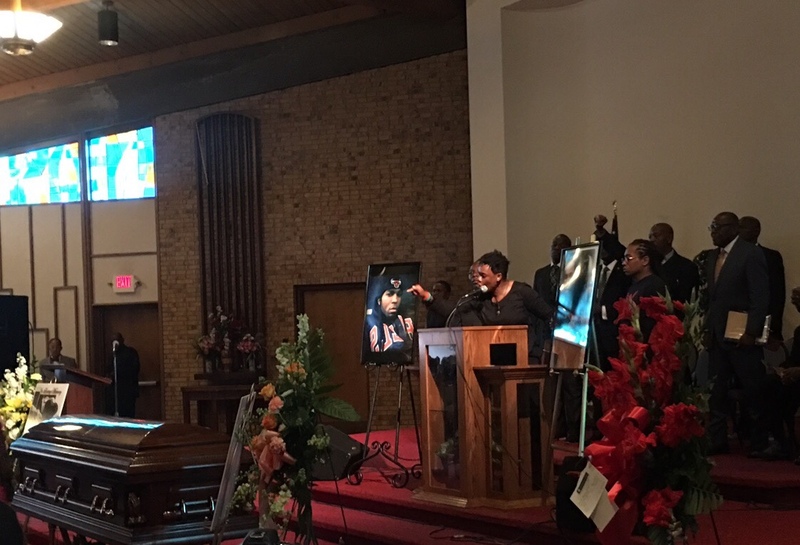 Kalambayi opened up by offering her condolences to the mother and family of Darren Seals. She continued: “It’s time to unite. But we have to define what unite means. Because we can’t unite over just anything...We have to unite as a people and say enough is enough! We have to have a structure that will keep us safe,” as she encouraged the people to join the Uhuru Movement. Kalambayi expressed to the attentive attendees that the black community has to get to a place where we prevent the State from murdering our people. She then urged them to join a revolutionary organization and become a part of a solid body. InPDUM’s President outlined the importance of learning from past mistakes within the struggle. Kalambayi expressed to Darren’s mother, “I wanna salute this mother, I love you and I hate that you have to sit there. The attendees, were absolutely inspired. Kalambayi made them feel uplifted with her powerful speech as they rose to their feet in thunderous applause. This is the power of our InPDUM President. This is the power of our Movement. Watch the video of the full speech below!